Mansfield & Green brand diaphragm seals typically comprise a metal, TEFLON or elastomer diaphragm mounted between two housings and sealed to prevent leakage of process gases or fluids. The space on the instrument side of the diaphragm, the connections and the instrument- sensing element, are all completely filled with instrument oil, silicon or other suitable fluid. 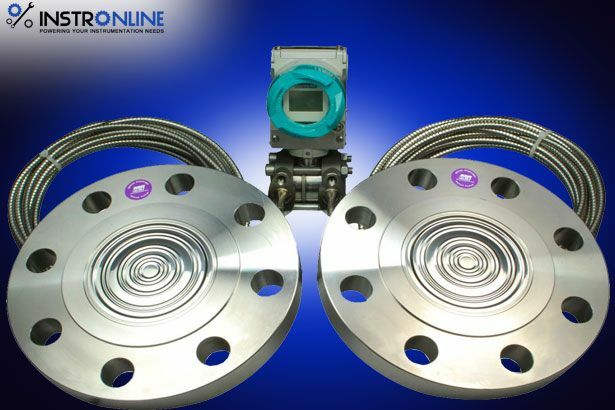 When the process line pressure is applied, the diaphragm exerts equal pressure on the instrument side of the seal producing a reading on the gauge or process instrument. Instruments may be attached directly to the diaphragm seal or connected remotely by means of a filled system – typically a length of armored capillary tubing. Mansfield & Green diaphragm seals may be used with pressure or vacuum instruments including gauges, transmitters, and switches that utilize C-type, helical or spiral bourdons, bellows elements, diaphragms or electronic strain gauge sensing elements. Seal pressure limitations vary according to seal design and their materials of construction. Thread attached, non-flow thru seals having a metal process bottom have a maximum working pressure rating from 2500 up to 5000 psig at 100°F (172 to 690 bar at 38°C). Type T TEFLON diaphragm seals have a maximum working pressure of 2500 psig at 100°F (172 bar at 38°C). In-Line Flow Thru seal Types R, S, and T are rated at 1500 psi at 100°F (105 bar at 38°C). Type L seals are rated at 1250 psi at 100°F (88 bar at 38°C). All flange attached seals are sized according to ANSI B16.5. ANSI standard flange attached and In-line Flow Thru seals are available with a maximum working pressure rating equal to the flange class pressure rating. Seals having a lower housing made of nonmetallic materials should not be used for working pressures in excess of 100 psig at 140°F (7 bar at 60°C). TEFLON threaded connections are limited to pressures of 50 psig at 100°F (3.5 bar at 38ºC). INSTRONLINE offers special diaphragm seal designs with a maximum working pressure rating of up to 5000 psig (690 bar). Please consult your INSTRONLINE representative for more information. L Series elastomer diaphragm seals (except for Types LB and LG) are ideal for most vacuum instrument applications in ranges from 0 to 29" Hg (0 to 736mm Hg at 0°C). Type ST Series seals are suitable for vacuum applications from 0 to 29" Hg (0 to 736mm Hg at 0°C).